RAISED ON: 100% vegetarian diet from birth to harvest, with a finishing ration of midwestern corn for a minimum of 120 days. TASTE IS: Guaranteed tender! Using only black angus genetics, the natural beef is of superior quality and satisfies the most discerning of palates. HOW HEALTHY: Durham Ranch Natural Beef cattle are raised on a “never-ever” program, meaning that these animals have never-ever been administered antibiotics, added hormones, growth promoting drugs, nor artificial ingredients. They can be source verified to ranch of birth and have been subject to humane animal handling practices for the entire course of their life. COOKING TIPS: Once you decide if you are going to cook with a moist or dry heat, the next step is to decide which method. 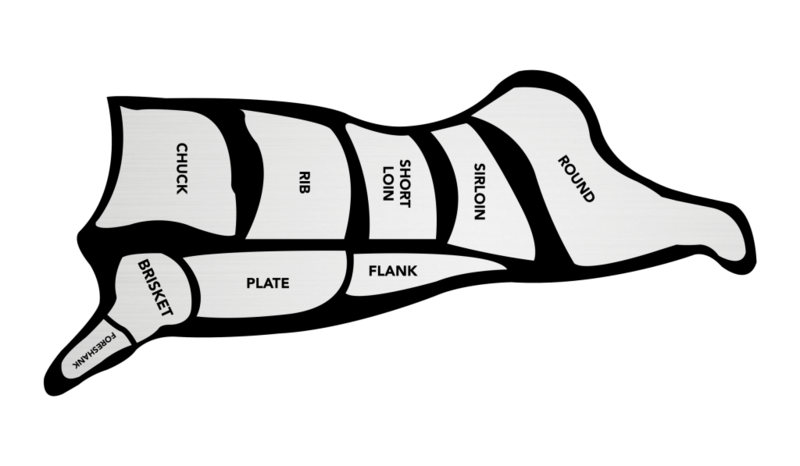 Our friends at the Beef Council have designed tips around each one of these methods that can give you an in-depth look. Grilling is a quick dry-heat method over charcoal, wood or gas flames. Use for more tender cuts. Less tender cuts can be used if marinated. Braising is a slow moist-heat cooking method using a small amount of liquid with a tight-fitting lid. Use for less tender cuts. Broiling is a quick dry-heat cooking method done in the oven using the broiler setting. Use for more tender cuts. Less tender cuts can be used if marinated. Oven Roasting is a dry-heat cooking method used for cooking bigger cuts of beef. No liquid is added or cover used. Use for more tender cuts. Pan Frying is a quick dry-heat cooking method using a pan with a small amount of oil. No lid is used. Use for thinner cuts. Also called sautéing. Skillet Cooking is a quick dry-heat cooking method using a pan on a stove top. No oil is used and the pan is uncovered. Use for thinner cuts or ground beef. Stewing is a slow moist-heat cooking method using a pot with a tight-fitting lid. The beef should be completely covered in liquid. Use for less tender cuts. Stir Frying is a quick dry-heat cooking method using a lightly oiled pan. Use high heat while continuously tossing ingredients. Any cut can be used as long as it is cut into thin uniform strips. Skillet-to-oven This is a dry-heat kind of two-step. Brown a thick filet in a skillet and pop it in the oven. Skillet-to-oven cooking delivers perfect doneness and sealed in juices. Indirect Grilling is a dry-heat, slow cooking on a grill requiring little hands on attention, yet maximum flavor. Impress your friends and family with this set-it-and-forget-it cooking method.